Mordaunt-Short Aviano 8 review | What Hi-Fi? 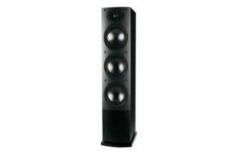 Once you've decided a floorstanding speaker is a better option than any of the standmounting alternatives, the temptation to buy as big a model as your room can accommodate is strong. After all, if space allows, why not buy as much cabinet and as many drivers as your money will stretch to? There's no doubt that if you line up these Mordaunt-Short Aviano 8s alongside, say, the Monitor Audio RX6s, your money has bought much more of a visual statement as well as quite a lot more raw material. It hasn't necessarily bought you any big aesthetic triumph, mind. The big M-Ss are humdrum, vinyl-wrapped boxes with scant visual appeal beyond the curved front baffle and promising driver-count. If discretion, a relatively luxurious finish or properly secured floorspikes are important, you'll discount the Aviano 8s out of hand. That would be to do them a disservice, though. Delivering The Beatles' Oh! Darling from the remastered Abbey Road CD, the Mordaunt-Shorts are a spacious, detailed and focused listen. Timing is good, with the leading edge of sounds prompt and packed with information, and, as the looks suggest, there's ample low-end presence and punch. The soundstage they create is broad and coherent, the overall sweep and attitude of the song prioritised just as much as the fine details. But when the going gets complex and involved, with Spiritualized's Songs in A & E, the Aviano 8s' sophistication and maturity become a hindrance as much as a help. There's no shortage of expression in the midrange, and high frequencies never threaten to become uncouth, but the relatively inhibited dynamic headroom and accompanying shortage of all-out excitement makes the M-Ss sound a little more pedestrian than they look. Of course, words such as ‘maturity' and ‘sophistication' might be just what many a prospective customer wants to read. For our part, though, we like our big, burly floorstanders to be able to rough it a bit when required.